No wall space, but need a wall? Add one of these Double Wide Slim Bin Racks to solve your problems. Our slim bin rack is lighter and less expensive than most other free-standing slat wall displays, which also makes them easier to move for a change in set up around your store. 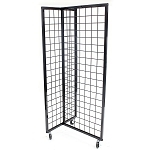 Included with the wire grid panel you receive four 12 by four wire basket bins and two 24 by four metal baskets to advertise various products in one sitting. These basket rack displays can be used anywhere that you might not of thought you had space for a display or maybe you just need a little extra display space. Wire displays look great with any decor and can be filled with a multitude of items, from toys, hardware items to even candy. You will find many uses for this wire display. Order your double wide metal display rack today.